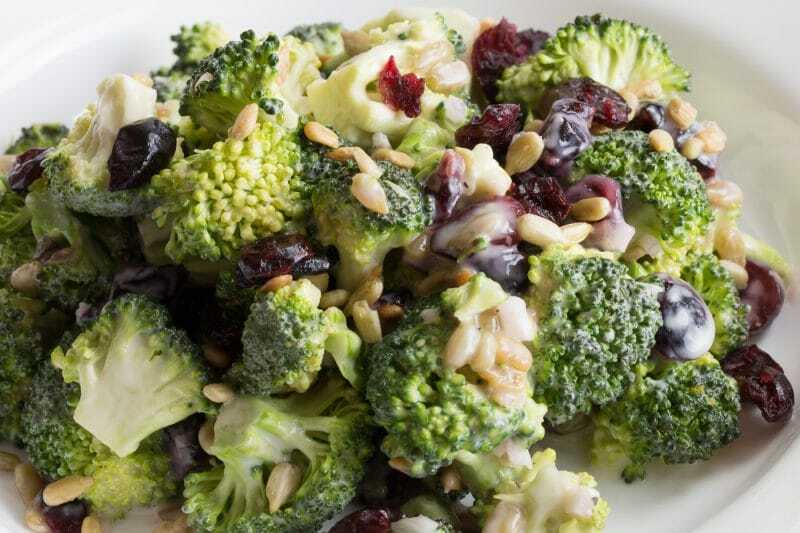 Broccoli Salad with Cranberries and Sunflower Seeds is super easy and quick broccoli salad that is easy to make in advance and is perfect for lunches or dinners. 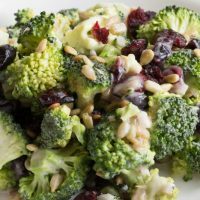 This broccoli salad recipe has dried cranberries, sunflower seeds, and a super easy delicious creamy dressing. My first time experiencing broccoli salad was during a work Christmas party when I was in graduate school. 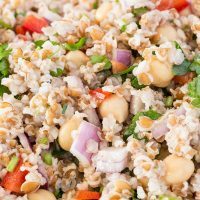 That version had a creamy dressing, pine nuts, and raisins. I loved it. However, no one would fess up to who made it, which was a little weird. 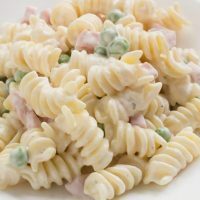 Anyways, I’ve hunted for a similar recipe and found some similar ones, so the wife and I just started tinkering with recipes we’ve seen and made our own. 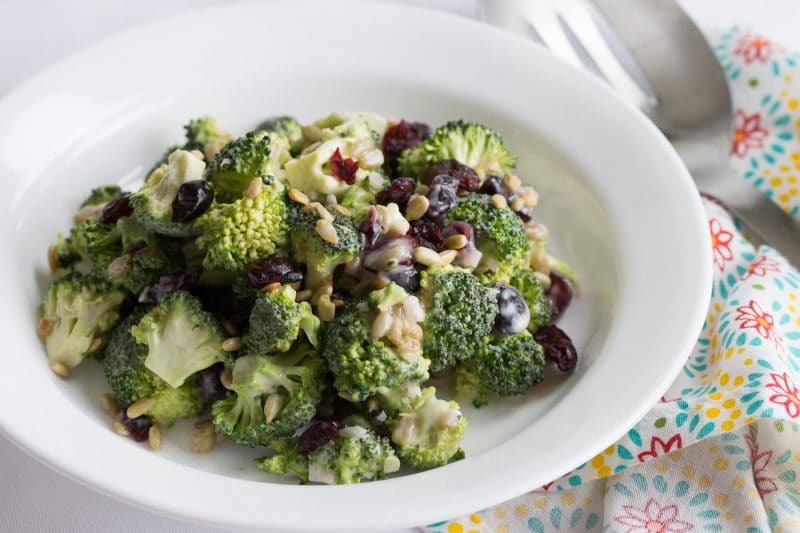 This broccoli salad recipe is perfect for those summer picnics, BBQs, or potlucks. It goes great with just about any grilled meat or by itself. 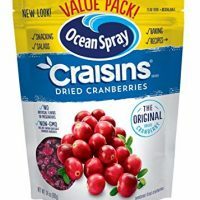 Feel free to swap out the cranberries for any of your dried fruits: raisins, dried apricots, blueberries, strawberries, or even mangoes if you’re feeling super fancy. Any kind of nut will work too. 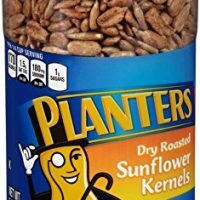 We’ve tried walnuts, pine nuts, peanuts, pecans, and sunflower seeds. We’ve tried almonds but didn’t really care for the texture, but give it a try and see which one you like. 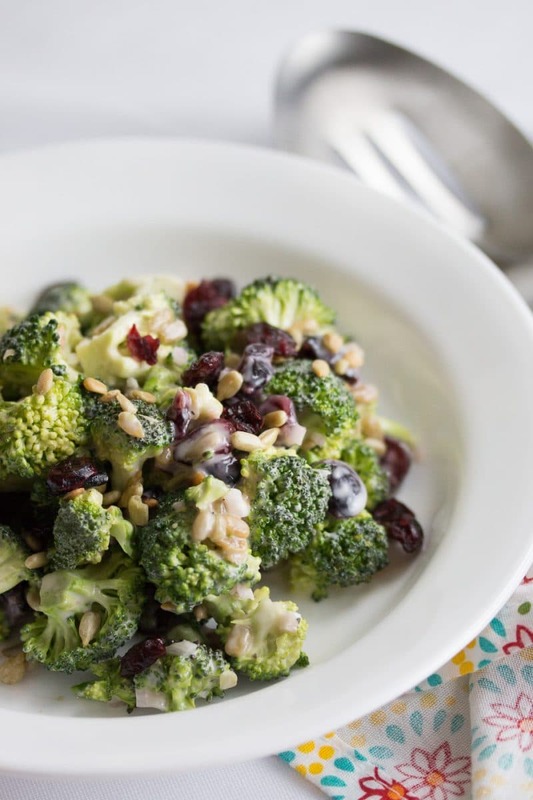 Also, the addition of cheese to this broccoli salad recipe is a welcome addition. Goat cheese is fantastic and so is feta cheese. Anything on the crumbly spectrum. We haven’t tried a blue cheese, but I bet Gorgonzola would be a fantastic addition, but I’d probably avoid full-blown blue cheese. When choosing a head of broccoli, choose one that has tight florets and are darker in color. When the florets get loose and lose their color, they are getting close to blooming. Cooking Light has a great explanation of the perfect head of broccoli. 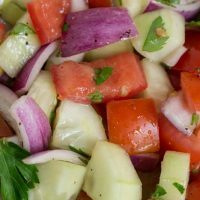 Refreshing summertime tomato and cucumber salad in a oil and vinegar dressing. 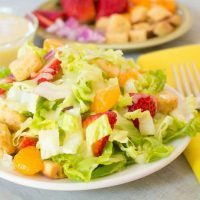 Refreshing green salad with strawberries and mandarin oranges topped with a coconut mango dressing. 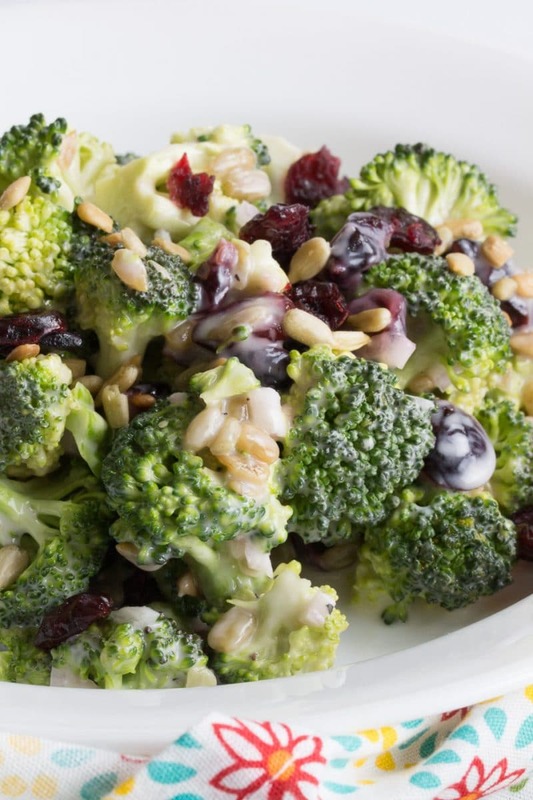 A creamy broccoli salad with cranberries and sunflower seeds. Combine mayonnaise, vinegar, and sugar into a large mixing bowl. Whisk together thoroughly. Taste the dressing and add salt and pepper to taste. Cut up the broccoli into small bite size pieces and add to the mixing bowl. 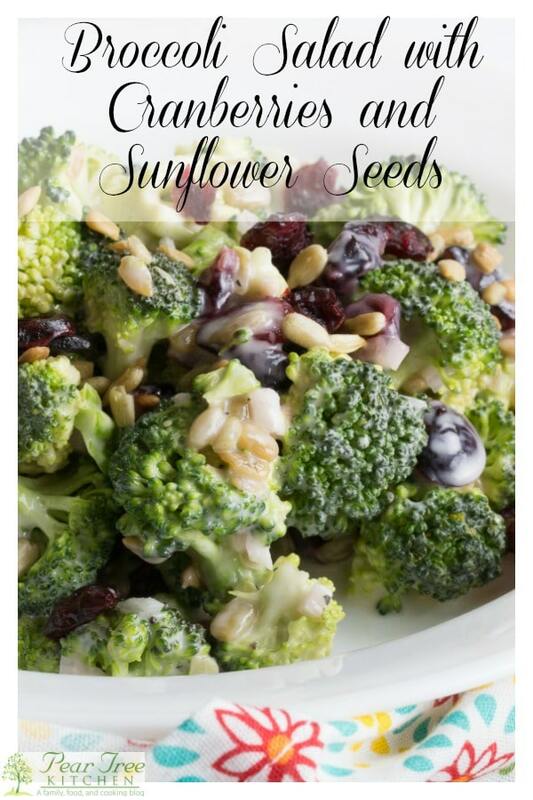 Add the dried cranberries and sunflower seeds. Toss to coat everything in the dressing. Let rest in the refrigerator for an hour to overnight. The vinegar is really important in this recipe. Taste the dressing and adjust the amount of vinegar to your liking. We've tried a bunch of different vinegars, but we find that white, red, and apple cider vinegar work best because of their amount of acidity, but feel free to experiment. Cook time listed does not include refrigeration time of 1 hour, please plan accordingly.